The death sentence is an acceptable punishment in the United States. It is the ultimate sentence that can be given to a criminal. Once a person is convicted and sentenced to die they are sent to death row to await their execution. Because of the appeal process the sentence may not be carried out for many years. There are thousands of prisoners languishing on deathrow in the United States awaiting their time. The accepted method of execution in most States now is lethal injection. This usually consists of the administration of three drugs given is stages. The prisoner is strapped down on a gurney in the execution chamber and an IV is started. The first drug given is a sedative, then a saline flush is given to clear the lines. Next a drug is given which paralyzes the inmate. Finally the last drug given stops the heart resulting in death within seconds. The execution is deemed completed when a doctor pronounces the inmate dead. All in all I pretty relaxing way to die for these violent offenders who in most cases killed their victims in the most callous and evil ways. Other methods still exist in some States. These are usually alternative measures which the inmate can select instead of lethal injection. They include the gas chamber, the electric chair, hanging and firing squad. Before lethal injection this was the most common method of execution. First used in 1924. The first night 5 men were executed using the chair or “Old Sparky” as it is sometimes referred to. Improper use of the chair resulted in painful death. This was another very common method used in many States. The gas used was hydrogen cyanide. Execution was in a sealed chamber which in some cases could be used to execution two individuals at once. It was expensive because of the maintenance needed to ensure the chamber didn’t leak. Death in the gas chamber was slow and painful. Not a common method it is still legal in Utah. It consists of a firing squad of five shooters, four have loaded rounds, and one has a blank round. The shooters don’t know which one has the blank. The inmate is seated and strapped in with a target placed over his heart. Little has changed with this method since the 1800’s. A noose is placed around the inmate’s neck, he is bound and dropped through a trap door. He drops until the rope snaps his neck. Proper executions using this method rely on an accurate calculation of the prisoner’s weight and length of rope needed. The noose should break the neck resulting in death. Improper calculations resulted in decapitations and injury without death. Because the death sentence is mandated by the court proper legal and application procedures are always followed. Unfortunately it is likely that innocent prisoners have been executed in the past. Over the last few decades since the advent of DNA testing many prisoners on death row have been exonerated of their crimes. Without this recourse they would have been legally killed. In the case of a death sentence the prisoner is entitled to all appeals available to him or her. Some States like California have separate penalty phases of trials to determine the appropriateness of the death sentence once the person has been found guilty. The prosecution and the defence both have the opportunity to present evidence and witnesses related to whether the prisoner should receive the death sentence for the crime. Society and especially the justice system are strange birds. The courts convict a murderer and then sentence him to death. Then when it comes time for the sentence to be carried out everyone gets up in arms that administering the sentence might cause him pain! Give me a break. Right now in Ohio convicted killer Kenneth Biros is facing death by lethal injection. Instead of three drugs they plan to only use one to kill him. His defence is petitioning the courts to stay his execution because the needle might hurt him. Cry me a river Biros. What did he do? He killed 22-year-old Tami Engstron in 1991. He offered to drive her home from the bar. Then he killed her and scattered her body parts in Ohio and Pennsylvania. Nice guy this Biros. Hopefully the courts will come to their senses and give this scum his due. The only unfortunate part is that his death will be painless compared to his victim’s. Kenneth Biros was executed today by the State of Ohio. His request for clemency was denied 7-0 by the appeal board. Another piece of human scum is no longer part of society. Thank you Ohio for having the balls to do this. Note: I refuse to publish his picture. He doesn’t deserve any kind of recognition. Lethal Injection: Cruel and Unusual Punishment? The State of Georgia plans to execute William Earl Lynd today by lethal injection. 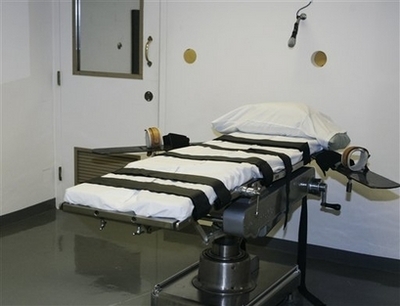 Executions in the United States were stopped for the last year because of an appeal to the Supreme Court. In the appeal it was claimed the method used, lethal injection, inflicted unnecessary pain. In this particular case the inmate Lynd was convicted of shooting his girlfriend three times in the head and face in December 1988. After he killed her he buried the body in a shallow grave. He then drove to Ohio and while on his little road trip killed another woman. This killer has managed to delay justice from his conviction in 1989 until today. During this time he has been fed and housed by the state and his legal rights protected. Before his execution he will receive a last meal of his choice. He has requested two pepper jack barbeque burgers with crispy onions, two baked potatoes with sour cream, bacon and cheese, and a large strawberry milkshake. How will the state carry out the sentence of death? They will strap him to a hospital gurney and a doctor will insert an IV in his arm. To end his life a three-drug cocktail will be given to him through the IV. The first drug is a painkiller designed to dull his senses. In effect this killer will feel nothing. I don’t think the same can be said for his victim, Ginger Moore. She was brutally shot. The bullets destroyed her head and face. Did she get a last meal of her choice? Did she die painlessly without trauma? I think not. The protesters who will invaritably be demonstrating against this execution need to think of Ginger Moore while they are carrying those placards around. The death penalty or capital punishment needs to be renamed. It is not punishment or a penalty, but rather a way society can ensure the William Earl Lynd’s of the world never hurt anyone ever again. Postscript: I was going to include a picture of the scumbag Lynd, but I couldn’t bring myself to post it.